This stunning amenity center is located on the west side of the brand new half-mile Beacon Lake. If you haven’t heard of this community yet I highly recommend paying it a visit. Beacon Lake contains 43 acres of a paddle friendly lake and is settled within 358 acres of nature preserve. The grand opening celebration is taking place this Saturday, February 23rd from 11am-3pm. If you’d like to get tickets to the Lake House Launch click here. 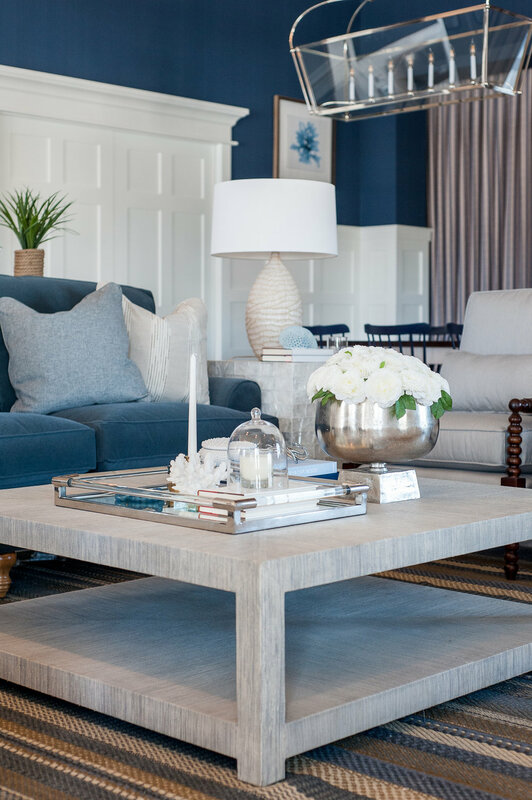 We were so fortunate to be able to design and furnish the clubhouse for such a delightful development team. Over the past three years we helped bring their conceptual vision to reality and love the final result. With this being our first project fully completed in 2019, we couldn’t wait to share it with you all! 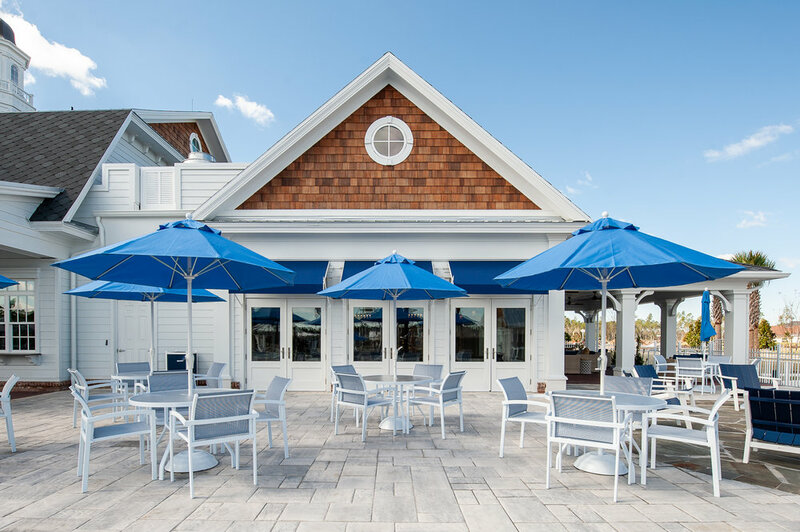 The exterior of the Beacon Lake Clubhouse, which was designed by Basham & Lucas Design Group, was inspired by the colonial, New England style with a nautical flair. We wanted to design the interior to compliment the beautiful exterior by incorporating these two styles. 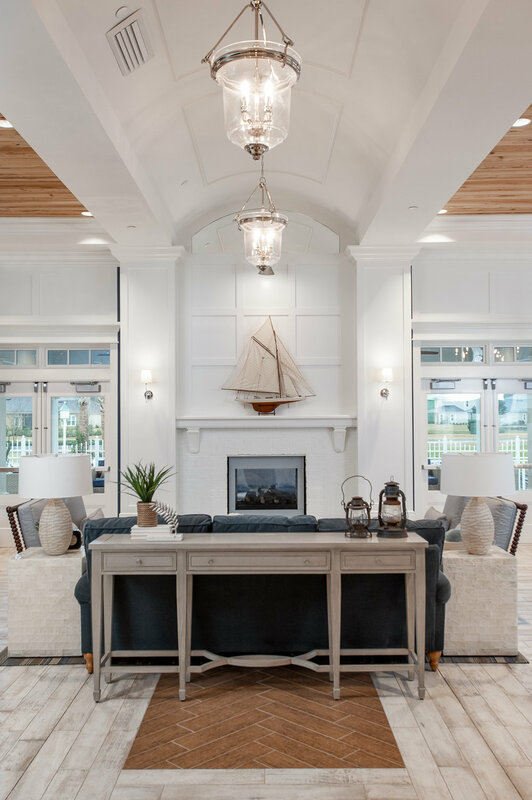 Upon entering the amenity center you’re greeted by an open breezeway with a jaw-dropping, custom built light fixture complimented by an arched tongue and groove ceiling, ship-lap and high wainscoting. We carried the porcelain tile floors out to this outdoor space to invoke a cohesive design. The small lounge within the breezeway is intended to be a relaxing space for visitors to wait for their company to join them before going into the clubhouse or out to the pool deck. The clubhouse consists of two wings: the Social Room and the Fitness Center, with the breezeway separating the two. The lead designer on this project, Michele, knew she wanted to make a statement upon entering the Social Room - and let’s just say she designed a show stopper of an entrance. 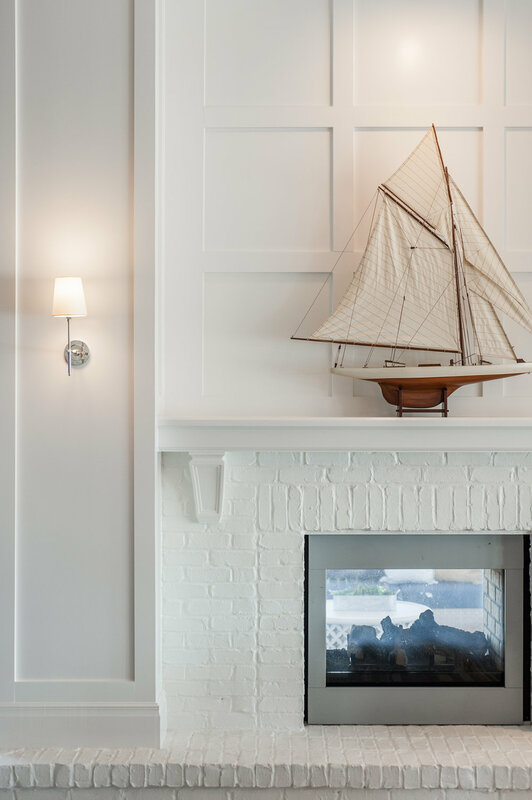 The barrel ceiling and the 4 beautiful pendants that line the hallway draws your eye directly to the centerpiece of the whole space: the fireplace. 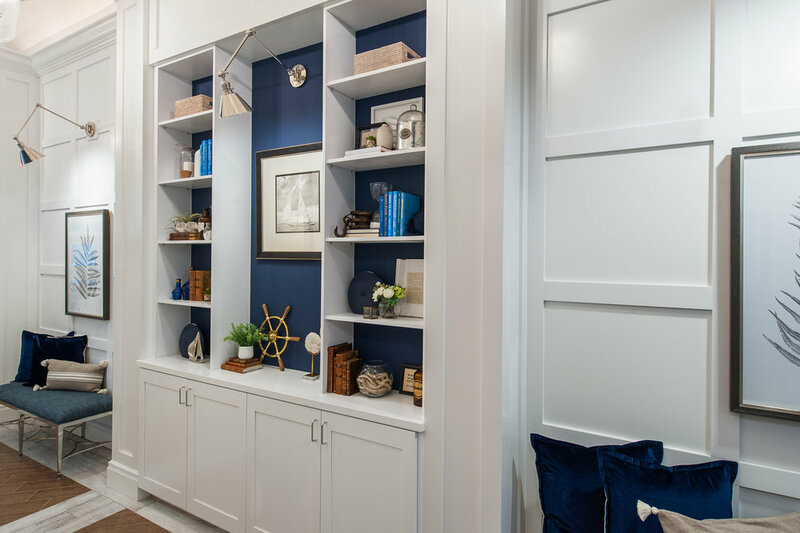 Here at Micamy we love a good built-in, so we incorporated a large, white built-in with plenty of storage for board games and other amenity features. The custom mill-work features plenty of open shelves to add character and personality to the space. The two benches on either side were intended as additional seating for guests, as well as a landing spot for bags or purses. Across the hall from the built-in and benches is the small foyer into the restrooms. Of course we couldn’t pass up a great opportunity for an accent wall! 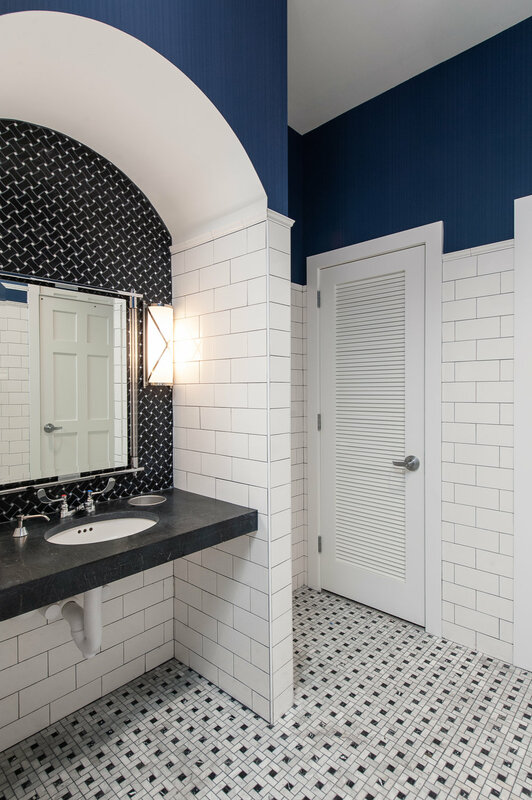 You might recognize this bathroom from a previous blog post! If you missed our #TileTuesday post about these tile selections click here to check it out. As you exit the restrooms and make your way down the hallway, it opens up to the rest of the Social Room. You hear the sound of heaven opening up when you walk into this room! 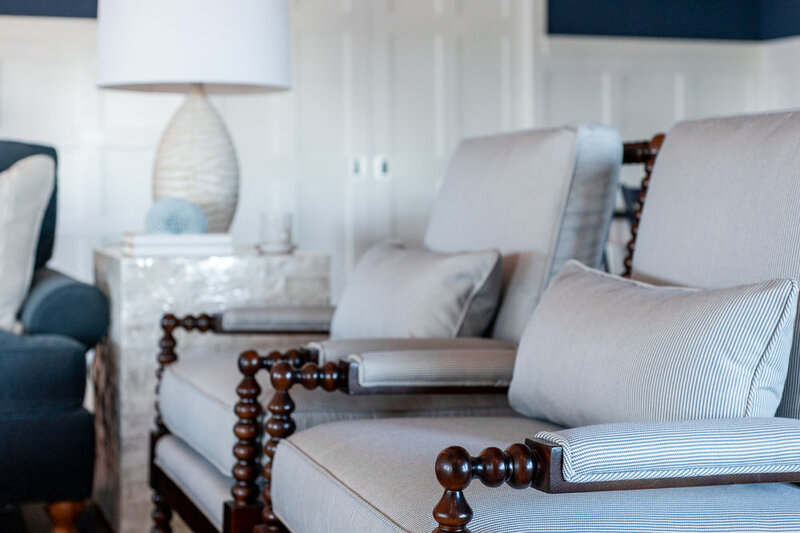 Like every amenity center, the residents, their families, and guests need a place to sit and congregate. 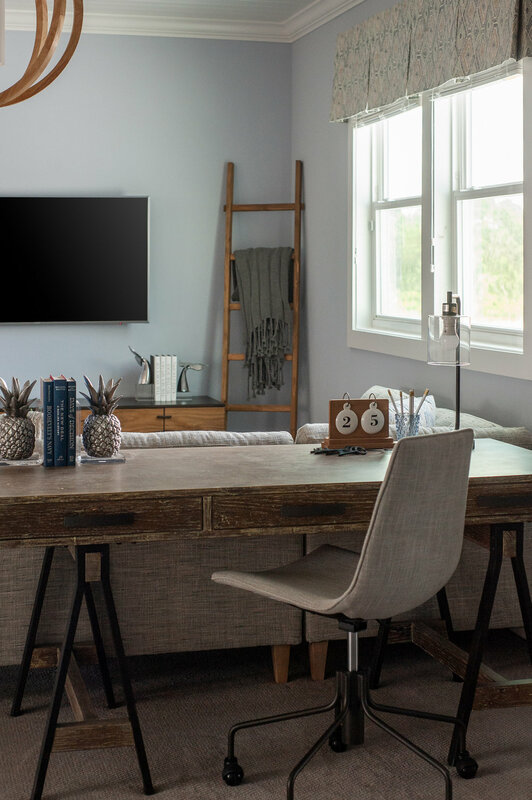 While soft seating is great and comfortable, something practical must be included in the space to accommodate wet bathing suits, or a place to host birthday parties, or even play card games. Our solution is just some old fashioned tables and chairs - particularly square ones that can be grouped together if need be. This clubhouse isn’t like any other amenity center in Jacksonville. 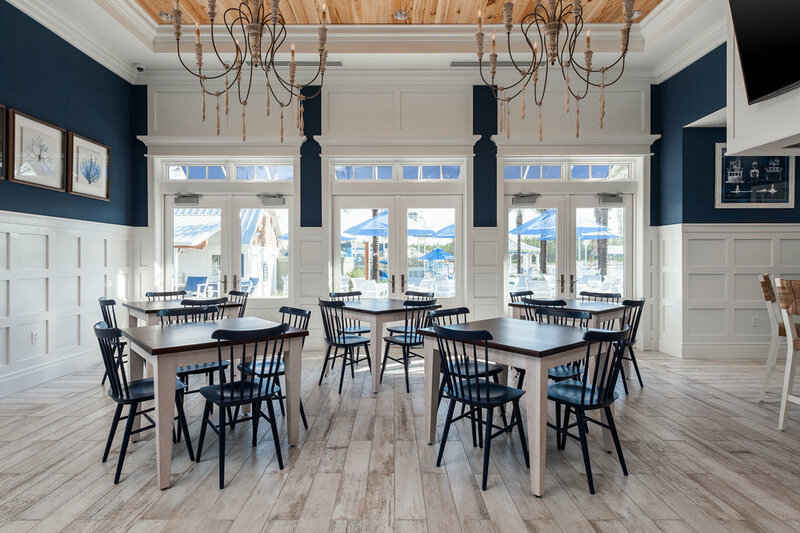 Our client wanted a functional, commercial kitchen to serve the pool deck, as well as a demonstration kitchen for cooking lessons and other catered events. With a demonstration kitchen comes a beautiful, custom, commercial hood. On the opposite side of the Social Room is a long gathering table for additional seating. 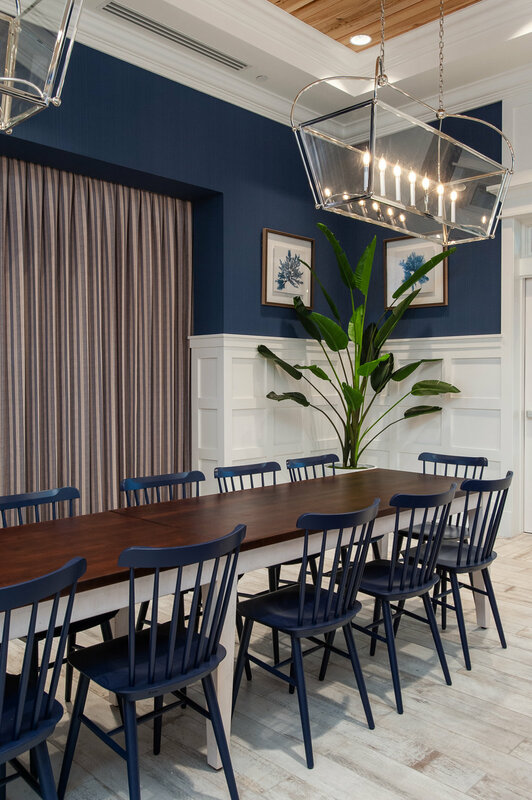 The design team used two linear chandeliers over the table, to juxtapose the New England style chandeliers across the way. 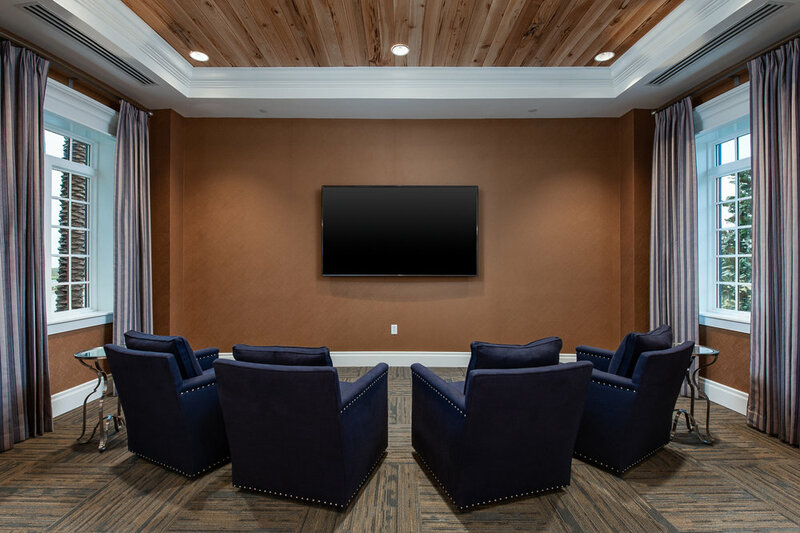 Another amazing aspect of this amenity center is the Theatre Room. 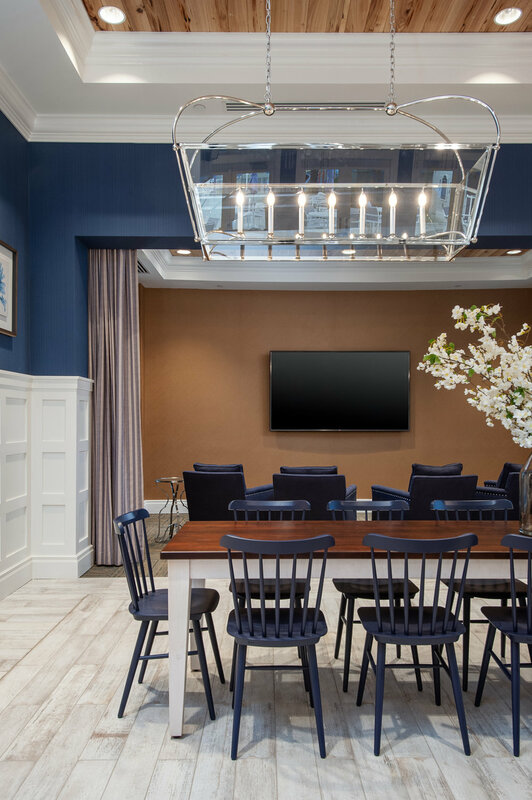 The design team incorporated retractable blackout curtains so residents can enjoy a true theatre experience all from the comfort of their own amenity center. As I mentioned previously, tables and chairs are practical and soft seating is for comfort and lounging. The design team created a cozy area for residents to congregate and relax by the fire with pieces that reflect the New England style. I know I’ve said this a lot, but this double sided fireplace is one of the best aspects of this amenity center. It creates two separate social areas that are able to enjoy the warmth of the fire. This outdoor patio off the Social Room is the perfect place to relax or host an event. 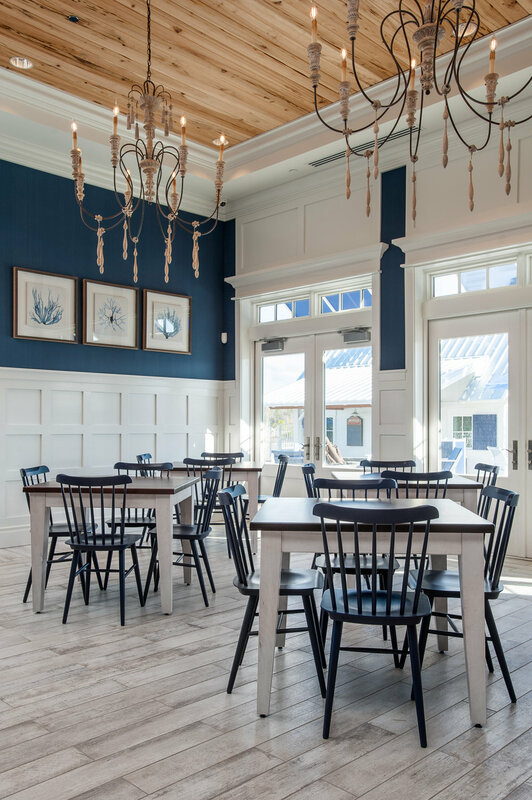 Thanks so much for reading about our Beacon Lake Clubhouse. 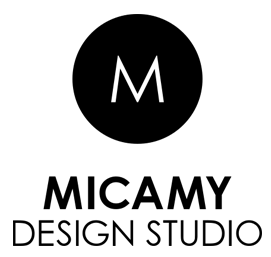 Stay tuned for the reveal of the Fitness Center and the Pool Deck in the next few months!